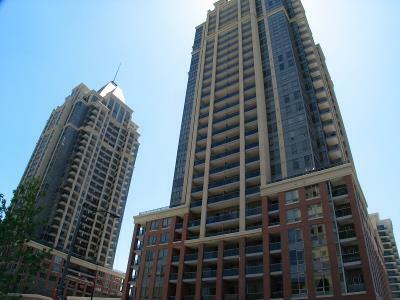 This Capital Tower condominium is located at 4080 Living Arts Drive in Mississauga, It was designed and built by Daniels Corporation in 2005. There are two condominiums in this condo community. Capital Tower South and Capital Tower North. They are 30 floors and 31 floors high .The condominiums won award for excellence for its unique urban neighbourhood in a three acre park setting in the centre of Mississauga. Capital Towers are just steps from Square One shopping center, Mississauga Living Arts Center, YMCA, Mississauga Central Library, Mississauga City Hall, Mississauga Transit Central bus terminal, Coliseum and Silver City cinemas, and Highway 403.Extensive landscaping creates a welcoming entrance courtyard. Spectacular furnished lobby with soaring vaulted ceiling. 24-hour Concierge welcomes guests and visitors alike. Four high-speed elevators reduce waiting time. One assigned parking space per suite. All appliances connected and ready to use Suite Hydro individually metered. Advanced Security Features Deliver Total Peace of Mind Enter-phone and cameras at all visitor entrances allowing in-suite viewing available through cable television connection Resident card access throughout all common areas Convenient well-lit underground parking with cameras in the garage at pre-selected locations, along with two-way voice communication to concierge or monitoring station Rough-in for intrusion alarm system with door contacts throughout and balcony or patio contacts extending up to the 6th level. Condo fees include water,gas,building insurance,parking,locker and maintenance of common elements.